Frozen has an interesting history. A loose adaptation of Hans Christian Andersen’s The Snow Queen, it was originally intended to stay closer to the original story. It was in and out of production from Walt’s time until it was finally released in 2013. Its ultimate production was troubled and very rushed, affording the creative team about two years to make the movie rather than the usual 4-5. Frozen’s story is one of enchantment, familial dysfunction and isolation. In the Norway-inspired Kingdom of Arendelle, crown princess Elsa is born with the ability to conjure ice and snow but limited capacity to control her power. When she accidentally injures her baby sister Anna, the King and Queen venture into the wilderness where the native trolls are able to help. They save Anna’s life but remove her memories of her sister’s powers. The leader of the trolls, known as Grand Pabbie, warns Elsa that her gift is powerful and dangerous, prompting the King to decide that Elsa needs to be better contained. The palace staff is reduced, Anna is moved into a separate room, and the king gives Elsa gloves to help her keep her powers under control. Throughout their childhood, Anna tries to connect with Elsa, but she won’t come out and urges Anna to go away. Years later, the princesses’ parents have died in a shipwreck and Anna has all but given up on her relationship with Elsa. On Elsa’s coronation day the two get into a dispute about the isolation of the palace and Elsa tells Anna to leave, but ultimately ends up running away after her powers are inadvertently revealed to the people. Anna then goes on a quest with ice harvester Kristoff to find Elsa, bring her home and save the Kingdom from a terrible winter storm her powers have created. The animation in Frozen is good, but not among the studio’s best work. The rendering of snow, in particular, is impressive, but the animation on the characters suffers at times, likely due to the rushed production schedule. There are also a few blurry frames, but they’re not too noticeable, provided you don’t pause the movie right at that moment. The film’s soundtrack was overpraised, especially around the time of release, but there is a lot to appreciate here. There’s a traditional chant sung over the opening that’s absolutely lovely and produces a sense of excitement for what’s to come. “Frozen Heart” feels at times like it’s trying too hard to get the double meaning across, but it’s a haunting tune and all the men singing together sounds great. “Do You Want to Build a Snowman?” is a generally pleasant song where we get inside the heads of the two princesses and see exactly how Elsa’s behavior affects Anna. It ends on a beautifully tragic note and segues brilliantly between the two very different tones. “For the First Time in Forever” is a great song and the best part of the whole movie. It’s grand, magical and beautiful, and in it, we get to see what the two sisters are thinking and feeling on coronation day. I love songs like this where we get multiple points of view. It pushes the story forward, it benefits the characters, and it’s extremely entertaining. “Love is an Open Door” is another brilliant duet, this time between Anna and the visiting Prince Hans. Hans’ parts take on a different meaning as the film progresses, sort of like “Mother Knows Best” in Tangled. While there are still good moments in Frozen after this point, “For the First Time in Forever” is also the highlight of the film with regards to the story and characters. We’re meant to feel sorry for Elsa when she runs away and basically flips the bird to her sister, kingdom and subjects. This doesn’t work at all, and she becomes very unlikable, talking about being “free” and not hurting people. But running away is hurting people, and the storm brought on by the building of her ice palace is deadly. I really hate this character, and I’m baffled that the writers and directors thought they were making her into some kind of a martyr. As an aside, I also really dislike her sparkly blue dress. Most of the costumes in Frozen are appropriate to the setting and time period, but when she’s in her palace she suddenly conjures a Las-Vegas-style party dress with a leg slit? And the resolution to her problem, where she realizes that love is the way to control her powers, makes no sense. How can feeling the emotion of love for her sister control her ice and snow? They don’t explain this at all; it’s just dropped on the audience at the end of the climax. Elsa isn’t the film’s main character, but it feels like she should have had an arc involving learning to control her ability; that would be so much more satisfying. But the worst thing about Elsa is the way she treats her sister, and that the audience is supposed to find this sympathetic. I have mixed feelings on the relationship between Anna and Kristoff. I want to like Kristoff; I love his character design, and he’s very different from any of Disney’s other male leads. But aside from being sarcastic and somewhat condescending when the two first meet, Kristoff doesn’t have much in the way of character traits. One would think his backstory would result in a more interesting character, but despite my finding him likable for superficial reasons they don’t do much with him. His reindeer Sven is somewhat expendable. They give the two a rapport through having Kristoff make Sven talk by doing a silly voice, and while it’s funny the first time, I mostly just ignore these scenes when I re-watch the film. Sven also acts too much like Maximus from Tangled to make much of an impression. Olaf the talking snowman is actually pretty funny and provides some of the film’s best one-liners. Though given Elsa creates both Olaf and Marshmallow, the large, mean snowman that guards her ice palace, I can’t help wondering exactly what the extent of her powers is. Hans is a huge disappointment as the film’s villain, and it feels like Elsa should have been the antagonist. She could even have been a villain with a redemption arc; that would still be better than what we get with either her or Hans. The decision was made for Elsa to be a sympathetic character in part due to urging from executive producer John Lasseter, who equated her struggle with his son living with diabetes. Co-director Jennifer Lee also based the relationship between the two princesses on her experience with her own sister, who also serves as an artist for the film. I can admire the intent, but narratively and for the character, it does not work. Everything that happens in the movie is Elsa’s fault, whether she’s “evil” or not. And she does literally nothing to make amends, leaving Kristoff and Anna to clean up a gargantuan mess. The actual reveal that Hans is the villain feels lazy and has extremely trite, stereotypical dialogue. “You’ll never get away with this”? Really? It feels like they added this whole element just for shock value, as it doesn’t benefit the story or characters. If they were trying to reiterate Elsa’s comment that Anna can’t marry a man she just met, I’d like to point out that this is fantasy. Disney doesn’t need to outline every possible situation and consequence for children, as their parents should be doing this. I don’t think people watch Disney Princess movies for messages about the dangers of marrying someone you met that day, as that doesn’t happen much in the civilized world. Therein lies another issue I have with Frozen. They poke fun at the Disney brand and tropes a few times throughout this movie, mainly the concept of true love and what it really means. Enchanted knew what it was, which was a loving parody of the golden and silver age Princess movies. Frozen doesn’t seem so sure, though. Sometimes Frozen wants to be a genuine, joyful Disney fairy tale musical, like during “For the First Time in Forever” and its reprise. Meanwhile, when they do criticize the Disney Princess mythos, it’s done in a hateful, sarcastic way that leaves a bad taste in my mouth. It feels like, “Snow White and Sleeping Beauty were wrong. This is how things are done.” It’s also bizarre how Frozen is set in a fictionalized version of Norway hundreds of years ago, but they impose modern morality and relationship behavior on the story. It doesn’t work for me. This is always the case to an extent in film; the current state of affairs will seep into the story and characters’ interactions, but here it’s so blatant as to constitute a major plot point and theme throughout the film. Dislike. This film tries so desperately to update the Disney Princess formula in a sincere way while also criticizing it and “calling out” past films and their heroines. Because Frozen can’t or won’t choose what it’s trying to accomplish, both aspects of the story come off as uninspired and somewhat frustrating. The trolls represent a huge waste of space in an already overstuffed plot. Their concept is interesting, and I’m not necessarily opposed to their character designs, but their scenes are annoying and they give terrible advice. Grand Pabbie is presented as noble and wise, and his people as helpful, but he’s as much to blame for Elsa’s childhood situation as her own parents. As previously mentioned, their “Fixer Upper” sequence stops the main plot in its tracks for the sake of humor and saying that Anna belongs with Kristoff. This girl, the kingdom’s Princess, is dying and they sing to her about who she should marry and how people don’t change. There are a number of ways in which the trolls could have either been left out or rewritten to serve the plot, but instead, they’re annoying hindrances. Another character I wish they had left out is the Duke of Wesselton, a secondary villain intended to fake the audience out while we still believe Hans is Anna’s Prince Charming. I’m not a huge proponent of shock value, especially in what should have been a traditional fairy tale. On top of that, he comes off as more irritating than funny or threatening. However, I really do love Anna. 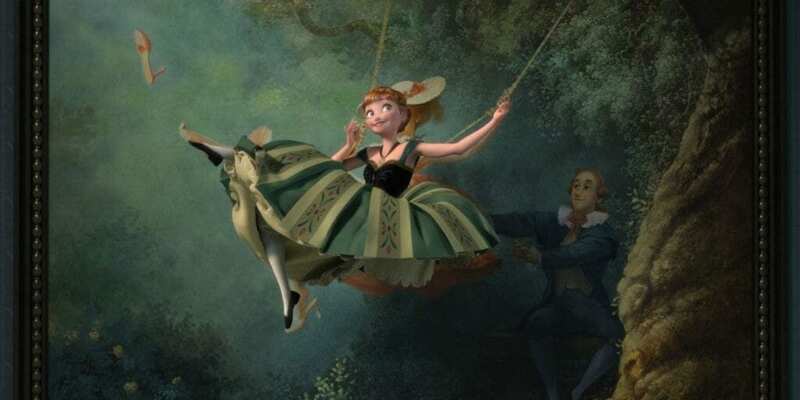 While Elsa is the would-be tragic martyr, Anna is the more traditional princess/heroine of the movie. She’s also the film’s true protagonist and the only character with a satisfying arc, something that people tend to overlook. I like and sympathize with her quest to find the love her sister has denied her. I don’t know why Frozen treats her like this is stupid; someone who was raised this way would probably act very similarly. She wants to feel cared for, as all people do. Her sister won’t even play with her when they’re kids, and after their parents’ deaths, she remains frigid, locked inside her room. Anna is caring, funny and adorable, and unlike Elsa, her behavior is understandable given the circumstances. Elsa never apologizes or tries to make amends with Anna until the film’s two spin-off short films, Frozen Fever and Olaf’s Frozen Adventure. I was thrilled with that development, but why wasn’t it taken care of in the first film? One thing at which Frozen succeeds, for the most part, is spectacle. “For the First Time in Forever” and “Let it Go,” in particular, contain several sweeping, jaw-dropping shots of the castles, people and backgrounds. I wish this kind of effort and beauty could have been put into some other aspects of the film, but what’s achieved here is commendable on its own merits. Frozen is also pretty good at creating drama when it’s not too busy undermining the tension with unfunny jokes and unnecessary characters. The voice acting in Frozen is nearly perfect, with excellent casting all around. Kristen Bell and Idina Menzel shine as Anna and Elsa, respectively, although it always sounds fake to me near the end when Elsa cries. Jonathan Groff is lovable and funny as Kristoff, but I still wish they’d given him an earnest musical number instead of just the dumb, sarcastic one. Santino Fontana has the voice of an angel, and even though Hans is the villain, I wouldn’t have complained about another song for him. Josh Gad is funny as Olaf, and Alan Tudyk provides the voice of the Duke of Wesselton. Even with characters I don’t like, such as Elsa, Hans and the Duke (basically half of the human cast), the actors are excellent. They do the best they can with a troubled screenplay, and that’s all that can be asked of them. Overall, I can’t say I hate Frozen, but I also can’t say I love it. Its elements range from excellent to eyeroll-inducing, with very little in between. The spectacle in the earliest scenes is breathtaking, but the prologue is stupid and poorly plotted, and the climax is ridiculous and forced. The story’s pacing is horrible, especially near the very beginning and in the last half-hour. The animation is great at some times and messy at others. The voice acting is very good all around, but there are entire characters who should have been changed or left out. There are things I love about this movie so I can’t say I regret seeing it, but I’d rather watch Tangled or Beauty and the Beast any day. Overall, I can’t say I hate Frozen, but I also can’t say I love it. Its elements range from excellent to eyeroll-inducing, with very little in between. The spectacle in the earliest scenes is breathtaking, but the prologue is stupid and poorly plotted, and the climax is ridiculous and forced. The story’s pacing is horrible, especially near the very beginning and in the last half-hour. The animation is great at some times and messy at others. The voice acting is very good all around, but there are entire characters who should have been changed or left out. There are things I love about this movie so I can't say I regret seeing it, but I'd rather watch Tangled or Beauty and the Beast any day.